Manchester City on the brink to secure their first signing of the winter window. Manchester City look to have landed their first signing of the January transfer window with a deal for the highly-rated goalkeeper. 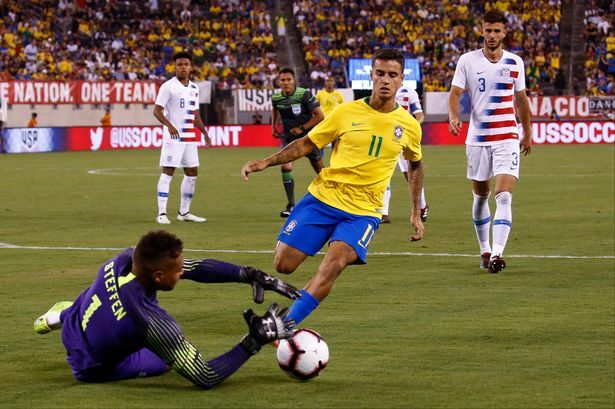 U.S. national team and Columbus Crew goalkeeper Zack Steffen has finalized his transfer to Manchester City after completing his medical and signing his new contract on Thursday. City have reportedly concluded a £6million deal to sign the USA goalkeeper. The 23-year-old has passed a medical and will move to the Etihad in January according to Goal, although given he is unlikely to gain a work permit yet he is expected to be loaned straight back out. Steffen’s move to City smashes the record fee for an MLS goalkeeper, previously set by Tim Howard when he joined Manchester United for $3 million in 2003. If he continues to be the USA number one, he could re-apply for a work permit in the summer should he be denied one upon officially joining City. The 2018 MLS goalkeeper of the year, Steffen enjoyed a breakout year for club and country, emerging as the first-choice goalkeeper with the USMNT, and turning in several standout performances, including a strong showing in the national team’s 1-1 draw with France prior to the World Cup. Steffen’s transfer to Manchester City comes four years after he left the University of Maryland as a 19-year-old to join German club SC Freiburg. He endured an unhappy stint at Freiburg, leaving the German club after a year and a half to sign with the Crew. In the long-term, Steffen is expected to become Ederson’s backup goalkeeper, appearing in cup competitions and providing competition for the Brazilian stopper. Steffen could be a good signing for the Citizens as his passing ability and ball-handling skills, as well as his experience playing in a possession-based system with the Crew, should help him adapt to Man City’s playing style and challenge for playing time once he is able to secure a work permit and join the first team. It’ll decrease Ederson’s workload as well.